GRAND RAPIDS, Mich. – Store guests will soon have a new way to support their favorite local charities, schools and other nonprofit organizations through the SpartanNash program, Direct Your Dollars™. The receipt-based program makes it easier than ever for eligible nonprofit organizations to earn $1,000. Direct Your Dollars will launch on Aug. 1 in more than 160 SpartanNash-owned retail stores and fuel centers in nine states. Direct Your Dollars™ replaces the Support Our Schools program offered in some of the company’s west stores and the Michigan-based Cash for Class program. For store guests, earning money through the Direct Your Dollars program is as easy as 1, 2, 3. Shop any of SpartanNash’s corporate-owned stores. Turn in your store receipts to your favorite participating nonprofit organization – and encourage your family and friends to do the same. When the participating nonprofit collects $150,000 in eligible receipts, they can turn them in for a $1,000 check from SpartanNash. Participating groups must have a valid 501(c)(3) determination to be eligible. Preschool and K-12 schools are eligible to participate, as well as school-sponsored groups and clubs. Faith-based and community service organizations can also participate in the Direct Your Dollars program. 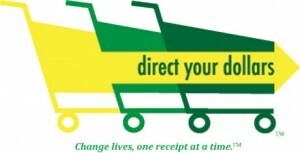 A section titled “Direct Your Dollars” will be included on all receipts to make it easier for organizations to compute their Direct Your Dollars receipt totals. Some purchases are excluded from the Direct Your Dollars program, such as tobacco, postage, fuel, gift cards and lottery, and will not be included in the “Direct Your Dollars” tally. Receipts from any SpartanNash-owned store – including Family Fare Supermarket, D&W Fresh Market, Family Fresh Market, Forest Hills Foods, VG’s, SunMart, Supermercado Nuestra Familia, Bag n Save, No Frills, Prairie Market, Pick N Save, Germantown Fresh Market, Dillonvalle IGA, Econofoods, Dan’s Supermarket and ValuLand – will be accepted and must total $150,000 before a check will be issued. Organizations interested in participating in the Direct Your Dollars program can visit SpartanNash.com/DirectYourDollars for promotional materials, receipt submission forms and more.